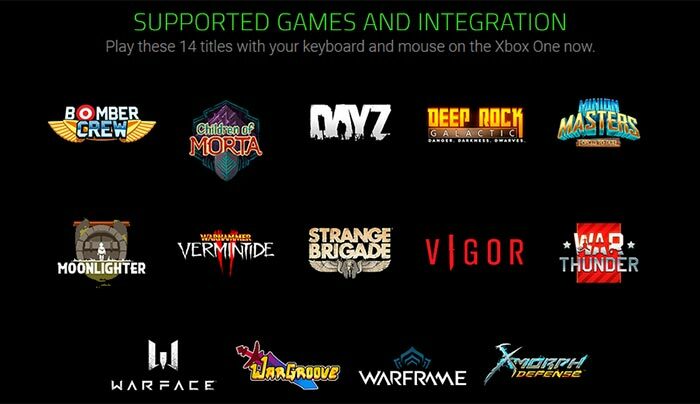 Back in September we first heard officially that Xbox One mouse and keyboard support were to debut during the XO18 show. In November at XO18 in Mexico City we heard about the range of games coming with mouse and keyboard support, and that existing PC mouse and keyboard combos would likely work fine, but that "the best mouse and keyboard experience on Xbox One will be available through Designed for Xbox mice and keyboards". Razer will be Microsoft's exclusive partner for a 'Designed for Xbox' mouse and keyboard set, Razer were happy to boast. At XO18 the gaming PCs and peripherals firm released a teaser video which revealed very little about what the new input peripherals would look like. We were told that the full reveal would come at CES 2019 in January. At the weekend, Razer decided to reveal the first pictures of its upcoming wireless mechanical keyboard and mouse designed for the Xbox One. An updated teaser video showed a glimpse of the combo in operation too. As well as supporting features such as a dedicated Xbox button and 'Xbox Dynamic Lighting', the new combo will leverage "our industry-leading gaming technologies," says Razer. In the video you can see Razer CEO Min-Liang Tan claim that the new input peripherals were redesigned from the ground up and will "reinvent gaming on the couch". My first thoughts about how Razer would implement a sofa-friendly Xbox One mouse and keyboard immediately surfaced the 2016 Razer Turret lapboard design. However, Razer has had plenty of time since then to think of design improvements for such a proposition. In the images you can see the Xbox One keyboard looks much more like a traditional TKL gaming keyboard product. To me it looks like the mousing surface area will extend from the side of the keyboard. It might even be able to slide out to varying degrees and from both sides of the keyboard base. One would hope that it is really rigid and large enough for a good mousing experience. The Razer Xbox One mouse and keyboard combo will be officially unveiled on 8th January, at CES 2019. Whilst this is going to cost a fortune, hopefully normal USB keyboard integration is on the way and upcoming games will integrate support as standard. Why do I say hopefully? Because if PC component suppliers keep on this path they're on, I will be priced out of the PC gaming market. I simply won't see it as being worth the money. This will result in me considering strongly buying a console as a cheaper way of gaming, especially if I can use a mouse and keyboard. I can't use console controllers properly at all. When you consider my last GPU alone cost almost the same as an entire console set up (which will have easier access to VR as well if you're so inclined), you start seriously debating the merits of PC gaming. For me, at the moment, a PC is still worth it for the other uses as well but its time is coming. I'm trying to work out why it's so chunky in it's design…. there are so many ‘lapboards’ out there already and many of them are considerably sleeker than the one shown here. I think it's the over the top gamer design they think all gamers want. Like laptops with vents that look like a F35 for no good reason and so on. I suspect they did some market research and found this kind of big, chunky, manly, “I'm not compensating for anything, honestly” design is most popular. you would think that a console has no need for F(unction) keys and all the ancillary stuff we have gathered over the years. You know, add random new keys and make the key codes totally different so people have to buy the expensive hardware, I really think they missed a trick there. Also, its prob that thick to cope with the inevitable rage quits and launching it across the room. There's a certain satisfaction in belting a keyboard so hard with a flobby gel wrist rest and watching the keys bounce off the ceiling. Also is a good way of learning exactly where the keys live on the keyboard when you have to reassemble it.